Time: 2 hrs. 15 mins. 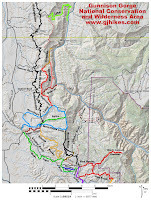 The Bobcat trail is located in the Gunnison Gorge National Conservation and Wilderness Area near Delta, Colorado. The trail begins on a high ridge at the end of the Bobcat Road where it descends into the Gunnison Gorge coming to an end on the banks of the Gunnison River. The last section of the trail requires rock climbing skills to get all the way down the cliffs to the river. If you go for reasons other than fishing the gold medal waters of the Gunnison River then you will be able to find some great places to view the gorge from the higher cliffs that don't require the rock climbing skills. The quickest route to the trailhead is to follow the Falcon Road east from Olathe. Once you reach the Gunnison Gorge boundary the Falcon Road transitions to become the Peach Valley Road. 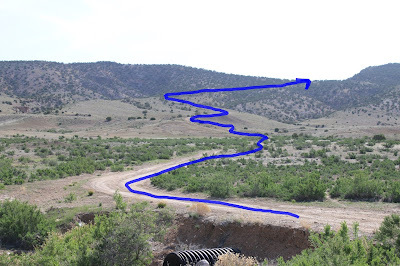 Follow it for about 2.8 miles and turn right onto the Bobcat Road. WARNING: This end of the Peach Valley Road gets ridiculously slick after a soaking rain and should be avoided. The Bobcat Road requires a high clearance vehicle. We have made it several times with only 2-wheel drive. The 2 mile climb that will take you all the way up to the ridge gets rocky towards the end. There is a picnic area and fee station at the trailhead. Be sure to place one copy of the pay slip on your dashboard and carry another copy on your person while in the area. From the trailhead follow the well worn trail as it gradually descends towards the gorge. The trail gets a little rocky in places but it is hardly a bother with such beautiful scenery to keep you distracted. Near the 0.7 mile point from the top the Bighorn trail branches off on the left. 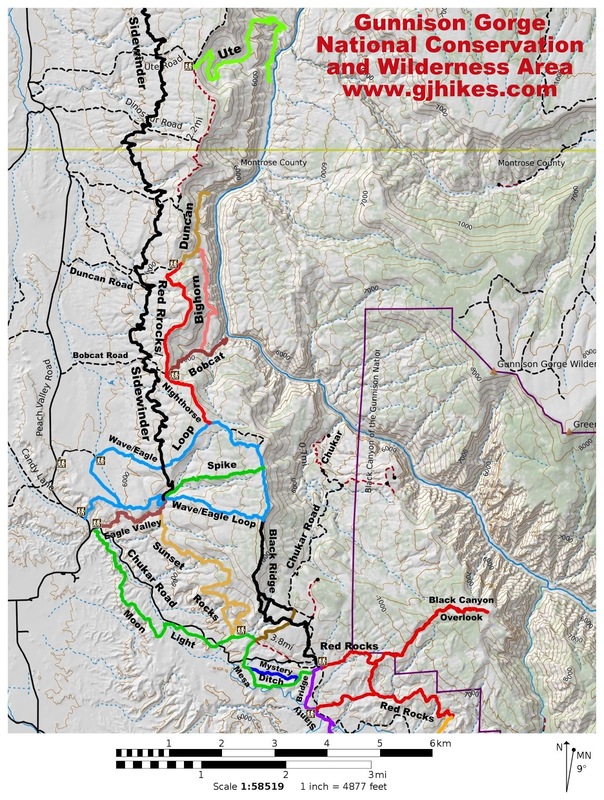 The 1.7 mile long Bighorn trail follows a bench that leads from here over to the Duncan trail. Bighorn sheep can be spotted at times along both the Bobcat and Bighorn trails. The descent continues after passing the Bighorn trail. From this point the rocks begin transitioning from sandstone to granite. At the 1 mile point there is a short trail on the left that leads to an overlook where you can get some good looks at the river as it courses through the rugged confines of the gorge. The Gunnison Gorge is just downstream from the Black Canyon of the Gunnison National Park. Other than some of the cliffs not being quite as high the scenery is very similar and quite breathtaking. The trail gets very steep and becomes very primitive as it continues until eventually the hiking turns into rock climbing. We stopped at the point where we felt the risk was beginning to outweigh the reward and after taking a few more pictures headed back up the mountain. The waters of the Gunnison River between Blue Mesa Reservoir and its confluence with the North Fork are forthemostpart always the same green color as seen in this photo. The sediments all settle out as the water passes from one dam to the next. The hike back up to the ridge involves a little more than 700 feet of elevation gain. It is spread out over more than a mile so most hikers should have little trouble with it. The Gunnison Gorge is a beautiful place that is rewarding to experience whether viewing it from the rim or hiking into its midst. If you would like to see it for yourself then all you have to do is 'Take a hike'.